These drills are slight revisions of the Concepts from last week, using some variant footwork and handwork. From Guardia Alta, pass with your right foot into large pace, throwing a mandritto to the head ending in Sotto il Bracchio. Redouble with a riverso ending in Coda Lunga Stretta as the left foot comes behind to complete the pass. From Guardia Alta, pass with your right foot, and throw a mandritto to the leg ending in Sotto il Braccio. Traverse left and throw a riverso to the face, ending in Coda Lunga Alta. From Guardia Alta, throw a mandritto to the head that ends in Sopra il Braccio. Slip the right foot back to the left, then pass right, lifting the hand into Guardia d’Alicorno and then throwing a mandritto to the face, ending in Sotto il Braccio. From Guardia Alta, throw a mandritto to the head that ends in Sotto il Braccio. Redouble with a rising riverso to the sword hand ending in Guardia di Testa. All our training up to this point has been about learning how to cut smoothly and effectively, so that the initial cut can be turned into a redoubled blow. In any fencing system offence without defence does not constitute a proper fencing system. This week we start to add the other half of the game that makes this a proper fencing system. The first 2 actions we’ll be looking at are universal defensive actions that defend against most generic attacks. These are the parry with the buckler and the true edge parry using Guardia di Testa. In both cases the success of the defensive action relies on having good skeletal alignment providing a ground path for the disposition of the blow energy. Beat the rim of the buckler up and down in response to the attack. The opponent throws mandritto to the head of the defender on a right pass. The defender extends the buckler into the opponent’s sword hand on a left passing step, parrying the blow. The forearm should be rotated during the action so that the buckler handle crosses the line of the opponent’s sword as this gives the strongest parry. The buckler thumb is typically at about 2 o’clock. 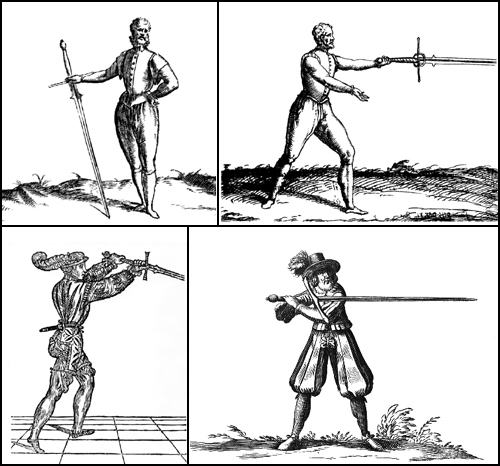 Repeat 5 times, ensuring the buckler crosses the line of the sword in each instance. Repeat the sequence with the opponent throwing fendente, riverso and rising riverso with 5 repetitions of each. The buckler parry relies on pushing the apex of the cone of defence created by the buckler into the sword hand of the opponent. This eliminates any possibility of the attacker redirecting the blow. The blow should be caught on the rim of the buckler. The best place to catch the blow is 45° either side of the top of the buckler. This is achieved by rotating the forearm to align the buckler handle so that it crosses the line of sword. The strength of the parry comes from the skeletal alignment from buckler hand to rear foot. 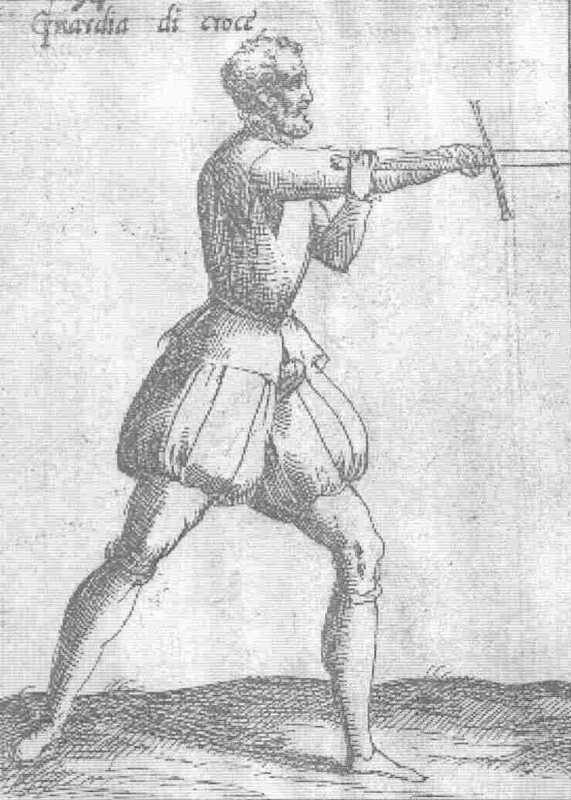 Against the descending blows the buckler hand should be aligned in a position similar to Guardia di Testa, which allows the energy of the blow to be dissipated via the ground path trough the rear foot. Passing forward at first seems to put us into danger, however we are actually increasing our safety by intercepting the sword at the forte which has less force than that delivered at the debole (tip). For each of the different cuts, the alignment of the buckler to the sword is done by turning the torso at the waist. Feint a montante, and pass with the left foot into Guardia di Testa to parry the blow. Riposte by passing right and throwing mandritto, ending in Guardia di Testa as the left comes behind the right. The attacker starts in Guardia Alta and the defender start in Guardia di Testa, sword foot forward. The attacker throws a mandritto to the head on a right pass. The defender defends with a left pass, parrying the blow in Guardia di Testa. Repeat 5 times, ensuring the sword arm aligned towards the incoming low. Repeat the sequence with the attacker throwing a fendente and a riverso with 5 repetitions of each. Guardia di Testa is one of the primary true edge parries against descending blows. The strength of the parry is provided by the strength of the skeletal alignment and the ground path it provides for absorption of the blow energy. Like the buckler parry the step forwards helps catch the blow before it comes to full power, and uses the turning torso to align the parrying sword with the incoming blow. The most common mistake is to not make proper skeletal alignment either by dropping the hand or bending the arm at the elbow. Checking the body alignment before undertaking the drill is very useful for ensuring correct technique. 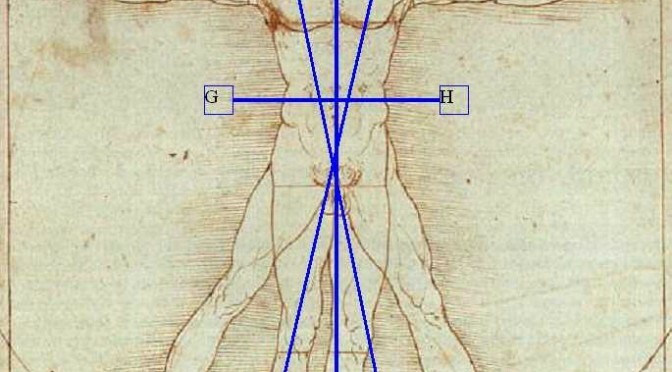 The mnemonic people should remember for making the proper sword alignment in Guardia di Testa is 45° up, 45° across, 45° forward. This sword alignment creates the glancing surface that directs the incoming blow towards our forte where we have most strength in the parry, or completely deflects the blow towards our outside as a glancing surface. This week we started on developing redoubled actions with the spadone. This is actually one of the strengths of the weapon due to the momentum it generates, allowing us to continue cutting smoothly. The key redoubled cuts practised were double descending cuts, and the tondo cuts that turn over the head. From Right Guard, Point Behind throw a mandritto to the head on a right step forward. Without moving the feet, allow the sword to continue in a descending circular path, returning for a 2nd mandritto to the head. The 2nd cut is made with extended arms and allowing the wrists to turn, which conserves the momentum of the sword. From Left Guard, Point Behind throw a riverso to the head on a left step forward. Without moving the feet, allow the sword to continue in a descending circular path returning for a 2nd riverso to the head. The redoubled cut can also easily be thrown as a tondo cut in the high line at the head, and are also called helicopter cuts because they resemble helicopter blades in the way they turn overhead. One of the chief advantages of the tondi is that they can be made either with the true edge or false edge, and you can pick the easiest variant depending on circumstance. The rapid change of line that this redoubled cut provides is also very difficult for the opponent to parry. From Right Guard, Point Behind throw a mandritto to the head whilst stepping forward with the right foot. Continue the cut as a circular cut and as the sword begins to travel upwards, lift up your hands and turn them such that the sword travels over your head finishing as a mandritto tondo to the left temple of the opponent. 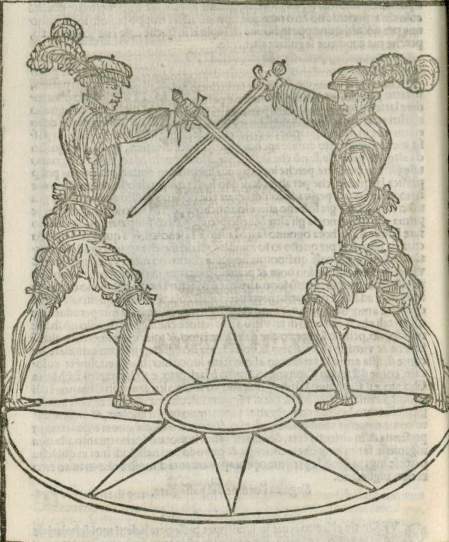 Continue the cut as a circular cut and as the sword begins to travel upwards, lift up your hands and turn them such that the sword travels over your head finishing as a riverso tondo to the right temple of the opponent. (Some people found this easier as the false edge cut. Lift the hands up to head height and allow the cut to continue as a circular cut, turning the hands so that the sword travels over your head finishing as a mandritto tondo to the left temple of the opponent. The imbrocatta thrust from either the point forward or hanging guards can be readily turned into a redoubled cut. From Left Hanging Guard, lean forwards and deliver imbrocatta to the chest. Drop the tip and using the momentum to turn the sword through a circular cut deliver a riverso to the head. From Right Hanging Guard, lean forwards and deliver imbroccata to the chest. Drop the tip and using the momentum to turn the the sword through a circular cut to deliver a mandritto to the head. These two static footwork drills allowed the students to learn how to turn the thrust into a cut. From Right Hanging Guard, make a volta stabile forwards and deliver imbrocatta to the chest. Drop the tip and using the momentum to turn a circular mandritto to the head on a right step forward. Make sure the step forward is performed in a true time with the forward motion of the mandritto. Redouble with mandritto tondo without moving the feet. Recover back with volta stabile to Left Hanging Guard. Make a volta stabile forwards and deliver imbrocatta to the chest. Drop the tip and using the momentum to turn a circular riverso to the head on the left step foward. Make sure the step forward is made in a true time with the forward motion of the riverso. Redouble with riverso tondo without moving the feet. Recover back to Right Hanging Guard. Repeat from 1. If space is limited turn to face the opposite direction in Left Guard, Point Forward and instead throw a riverso combination followed by a mandritto combination. This drill teaches the student how to combine thrusts, cuts and footwork. 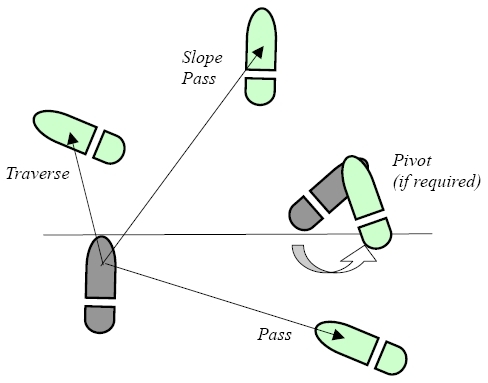 Many different combinations can be developed with various varieties of footwork. The lesson started with a revision of the core concepts from Lesson 1. Revise the basic guards, to reinforce the naming convention we will be using. Revise the naming of the 8 basic cuts. Passing forward drill, working through the 8 basic cuts. Pass and turn drill, working through the 8 basic cuts. The footwork from week 1 was almost all performed on a forward step, with a right foot step for cuts from the right, and a left foot step for cuts from the left. This week we add in the step back. The key to the step back is that the hips and shoulders must turn in alignment. Thus a cut from the right is made in conjunction with as left foot step back, and a cut from the right is made in conjunction with the right foot step back. We also added the passing step followed by volta stabile, which allows us to throw a cut and then rapidly recover to the defence of Hanging Guard, whilst withdrawing the body from possible harm. From Right Guard, Point Behind pass forward throwing mandritto, followed by a left step forward throwing a riverso. Continue forward throwing a rising mandritto on a right step and a rising riverso on a left step. Pass back with the left foot throwing a mandritto, followed by a riverso on a right step back. Continue back throwing rising mandritto on a left step back and a rising riverso on a right step back. Repeat the footwork sequence forward and back this time throwing mandritto falso, riverso falso, falso dritto and falso manco. From Right Guard, Point Behind pass forward throwing mandritto, and as the cut reaches the ground pivot anti-clockwise on the balls of the feet (volta stabile) lifting into Left Hanging Guard. Pass forward with the left foot throwing riverso, and as the cut reaches the ground volta stabile clockwise lifting into Right Hanging Guard. Repeat the sequence throwing rising mandritto and rising riverso. The thrust can be delivered either with one hand or two hands. The important aspect of the thrust with the spadone is to ensure that it is done such that you can immediately recover to a defensive position. The single handed thrust is performed by releasing the leading hand on the sword, to give maximum reach possible. To support the weight of the thrust the rear hand is extended with the hand in 3rd, ie palm to the inside. 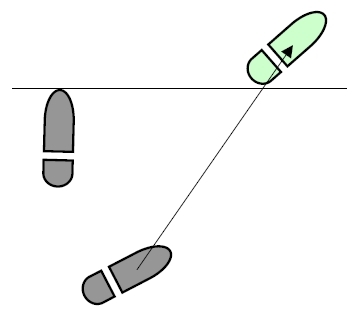 The recovery is done by stepping back with the leading foot pulling the spadone back into a hanging guard. From Left Guard, Point Forward, passing forward with the left foot throw a thrust by letting go with the leading hand to deliver the thrust with one hand. Recover the left foot backwards lifting the hand into Left Hanging Guard, bringing the leading hand back onto the sword hilt. Repeat from Right Guard, Point Forward this time recovering to Right Hanging Guard. The single handed thrust is effective yet risky attack due to the lack of control with the rear single handed grip. Thus the double handed thrust is the preferred method due to the greater control in the recovery. The key to the action is to deliver the thrust as an imbrocatta, keeping the leading hand underneath the grip to support the weight of the sword. From Right Guard, Point Forward, on a pass with the right foot throw imbrocatta and the volta stabile anti-clockwise pulling back into Left Hanging Guard. Pass forward with the left foot throwing imbrocatta, and volta stabile clockwise recovering back into Right Hanging Guard. This is the lesson notes for the first class at Stoccata on the use of Spadone, ie Italian Greatsword. The actual weapon being studied came to prominence at the end of the 15th Century, and became a mainstay of European infantry throughout the 16th Century and into the 17th Century. It averaged in length from 150 cm to 180 cm. As described by Alfieri, it was typically as long as a man is tall. 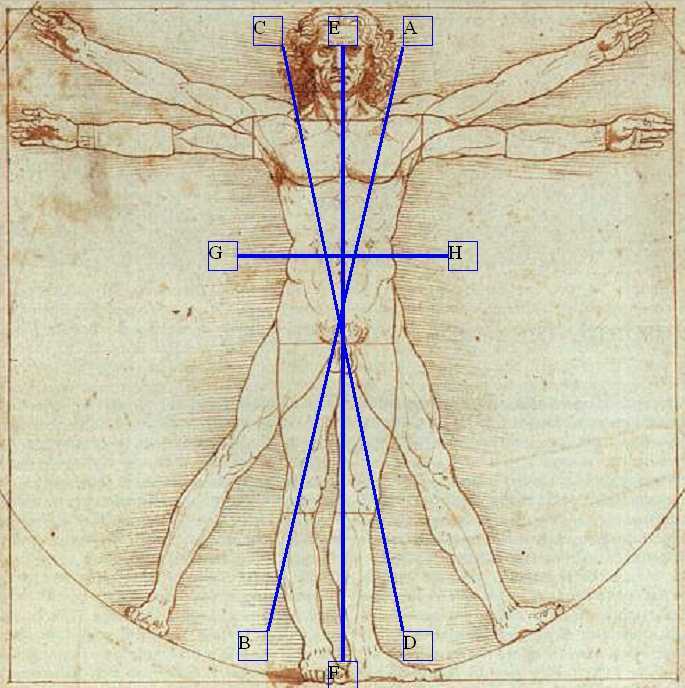 Our course is based on the work of Francesco Alfieri’s treatise Lo Spadone. We’ll be working from Ken Mondshein’s translation. In this first lesson we predominately worked from either Right or Left Guard. Cuts must be made with extended arms otherwise the weight of the weapon will cripple you! Let the momentum of the sword make the cut for you, as the length of the sword gives you all the leverage you need to power the weapon. You don’t need to muscle it! Mandritto cuts are made on a step forward with the right foot. Riverso cuts are made on a step forward with the left foot. Reason: The hips and shoulders MUST stay in alignment otherwise you damage your lower back when the hips and shoulders turn in opposition to each other whilst wielding a 2-handed weapon. In all of the exercises the cuts practiced were made in the order listed above, first with the true edge then with the false edge. Starting from Right Guard, Point Behind, pass forward with the right foot, throw a mandritto ending in Left Guard, Point Behind. Continue with a left pass throwing a riverso that ends in Right Guard, Point Behind . Repeat, throwing a rising mandritto and rising riverso. Repeat the entire sequence, throwing the false edge cuts. Starting from Right Guard, Point Behind, pass forward with the right foot, throw a mandritto that ends low and point forward. 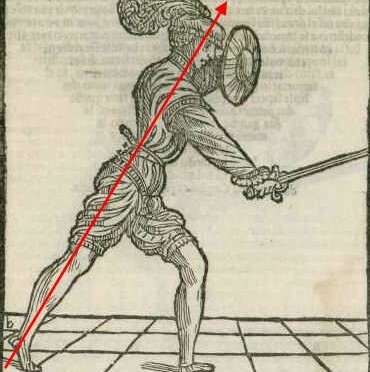 Immediately pivot on the balls of the feet to face behind, lifting the sword into the Left Hanging Guard. Repeat 2 times. Repeat the sequence throwing a riverso on a left pass, ending in Right Hanging Guard. Continue the drill working through each cut in sequence. Starting from Right Guard, Point Forward, lift to the Right Hanging Guard turning to face right and of a step to the right with the right foot throw a mandritto that ends in the right hanger. Turn left and repeat the right step throwing mandritto that ends in Right Hanging Guard. Continue making the 90° steps until you have made a complete 360° circuit, with the back foot in place. Repeat the sequence for all the cuts, using the Left Guard and a left foot step for the left side cuts and the Right Guard and a right foot step for the right side cuts. Starting from Right Guard, Point Forward, lift to the Right Hanging Guard and on a pass forward at 45° throwing a mandritto that ends in Right Hanging Guard. Pass back with the left foot throwing a mandritto that cuts at 120° to the left ending in Right Hanging Guard. Complete the sequence with a pass forward with the right foot throwing another cut at 120°. Repeat the sequence for all the cuts, using the Left Guard for the left side cuts and the Right Guard for the right side cuts. It’s Bolognese – everything must be chopped finely! This lesson builds on the previous lesson where instead of making one cut per set of steps, we start making one cut per foot step. This is a crucial part of the Bolognese system and reflects the energy conserving nature of the system. We continue working from Guardia Alta as our starting guard. Note how the cuts move from one guardia to the next, and the rising cut travels back up the previous descending cutting line. This is one of the primary combinations of the system, and is our first look at the concept of one step one hand action. Pass with the right foot, throwing a mandritto ending in Sopra il Bracchio with the right shoulder pointed at the breast of your enemy. Redouble with a riverso fendente ending in Coda Lunga Stretta and with a falso to the sword hand ending in Sopra il Bracchio. 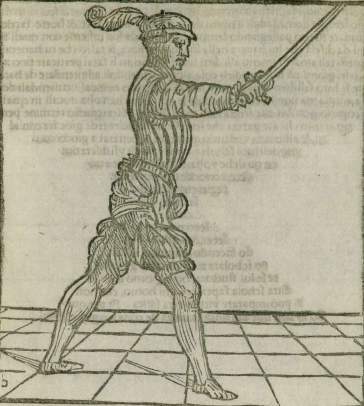 From Guardia Alta, make a passing step to the right with the right foot, cutting mandritto to the head, ending with the sword hand in Sopra il Braccio. Remember to turn the buckler forearm to create the gap for the sword hand to pass through. Let the momentum of the sword continue the rotation of the sword, so that it swings through and then cuts riverso to hit the other side of the head, as you make the corrective (backwards) step with the left foot. Allow the cut to finish, ending in Coda Lunga Stretta as the corrective step finishes. Throw a mandritto to the head that ends in Sopra il Braccio. Slip the right foot back to the left, then pass right with the right foot, lifting the hand into Guardia d’Alicorno and then throwing a mandritto to the face, ending in Sotto il Braccio. Throw a mandritto to the head that ends in Sopra il Braccio on a passing step. On the corrective step throw a mandritto to the face as a circular cut, ending in Sotto il Braccio. Let the momentum of the sword continue the rotation of the sword, so that it swings through and then cuts mandritto to hit the same side of the head, as you make the corrective (backwards) step with the left foot. Allow the cut to finish, ending in Sotto il Braccio as the corrective step finishes. This cut begins the similar way as the Concept 1. From Guardia Alta, on a step right, we cut a mandritto down onto the head, with the sword hand cutting to just on the outside of our buckler arm wrist. (Don’t forget to turn the buckler thumb to 10 o’clock!) 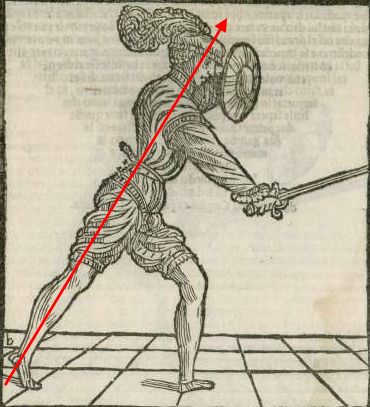 We then allowed the momentum of the sword to continue the cut into a circular one, and hitting to the head with a redoubled mandritto on the corrective step, finishing in the Sotto il Braccio (ie sword under the arm). Note how the actual drill practiced is different to the specified drill. We’ll be looking at this action next week when we start to look at the basic defences against the attacks, and show why the specified action by Manciolino is better than the sequence we actually practiced. From Guardia Alta, throw a mandritto at the head or sword arm that goes to Sotto il Bracchio. Redouble with a rising riverso also to the sword hand or face, returning to Guardia Alta. From Guardia Alta, make a passing step to the right with the right foot, cutting mandritto to the head, ending with the sword hand in Sotto il Braccio. Remember to turn the buckler forearm to create the gap for the sword hand to pass through. Redouble with a rising riverso, beginning the corrective step as the sword hand reaches the buckler. 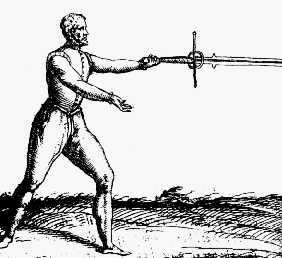 (This would be when the blade makes contact with the opponent’s sword arm or face). Allow the cut to finish, ending in Guardia Alta as the corrective step finishes. Unlike the other 2 concepts from this lesson this exercise was about redoubling cuts when we don’t have the momentum to work with. It should also be noted that the combination isn’t explicitly described by Manciolino, but is a combination of the various mandritti from Guardia Alta, which is referenced in several places, and one of the basic offences from Sotto il Braccio described by Manciolino in Libro 2, Assault 2. As strikes without shieldings are not done sensibly, so shieldings without a following of a strike should not be made, waiting for the tempos nonetheless. This is the area within which we can make an attack, which is roughly a bubble shape centred on the shoulder of the sword arm. Controlling the centre space means the opponent is denied the full use of their Death Bubble, and they will generally have to move to hit us. Feet are a shoulder’s width apart, with back leg mostly straight (knee unlocked!) and heel off the ground and the front leg also mostly straight and relaxed. Minimises our own target area available to opponent’s death bubble. Just the head becomes vulnerable, and this is protected by the extended buckler. Extended buckler is a defensive cone collapsing part of the opponent’s death bubble. Front foot steps backwards behind to come onto guard and the now leading foot will pivot slightly on the ball of the foot, realigning back towards the opponent. Relationship to the death bubble. The pass allows us to attack our opponent without stepping into their death bubble. This is best illustrated by the pass right from a left foot forward stance. Full cuts are any cuts that start from or finish in an open guardia. The open guardie are the ones where the sword is not in presence. 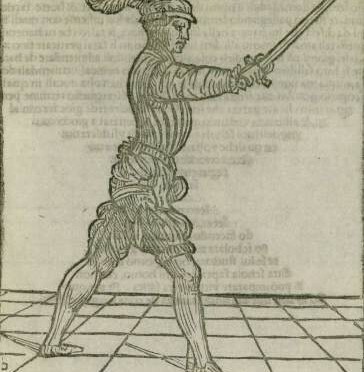 Cut must be made from behind the buckler, to keep the sword hand out of the opponent’s death bubble. The cuts are made on an almost vertical line which traverses the line from ear to opposite knee. This keeps the hand within the span of the shoulders which utilises the strong lifting muscles in the shoulder. Letting the hand drift outside the shoulder span shifts the weight bearing to the weaker stabiliser muscles in the shoulder, making a weaker cut and creating a muscle strain situation. Descending cuts lead with the elbow to keep the hand behind the buckler, making the threat first as well as protecting the forearm. The effect of this action is that is creates a cut where the tip of the sword travels in a straight line directly to the target, not the arc you would get if you cut with a straight arm. Rising cuts start with the wrist to bring the sword, and its subsequent protection, into play first. This again brings the sword into presence protecting the sword hand from a direct attack. The primary cuts practised are all full cuts, cutting through the opponent to an open position either high or low. To begin with we start with the 2 big descending cuts of mandritto and riverso, followed by the 2 main rising cuts of rising riverso and falso dritto. In all cases the cuts are practised on the pass. These cuts are actually done as a transition from one Guardia to another. The basic methods for throwing these cuts is described below.